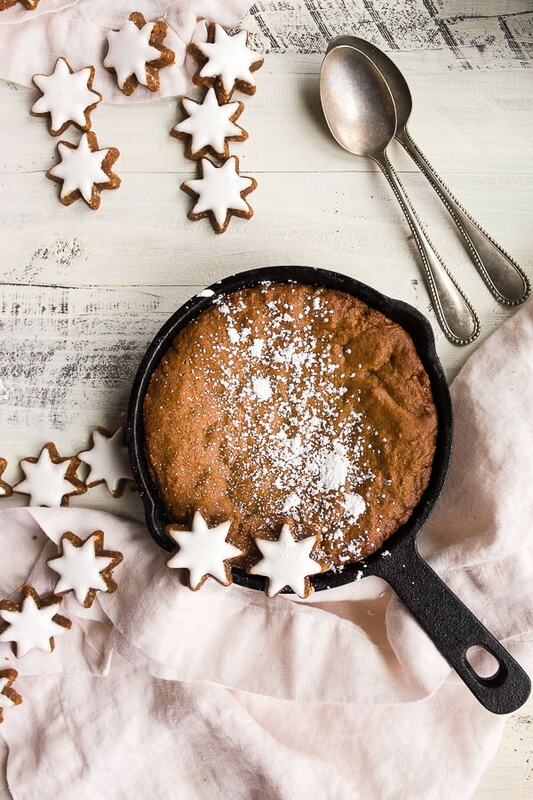 Cast iron skillet cookie for two, a gingerbread cookie made in two mini 6” cast iron skillets. 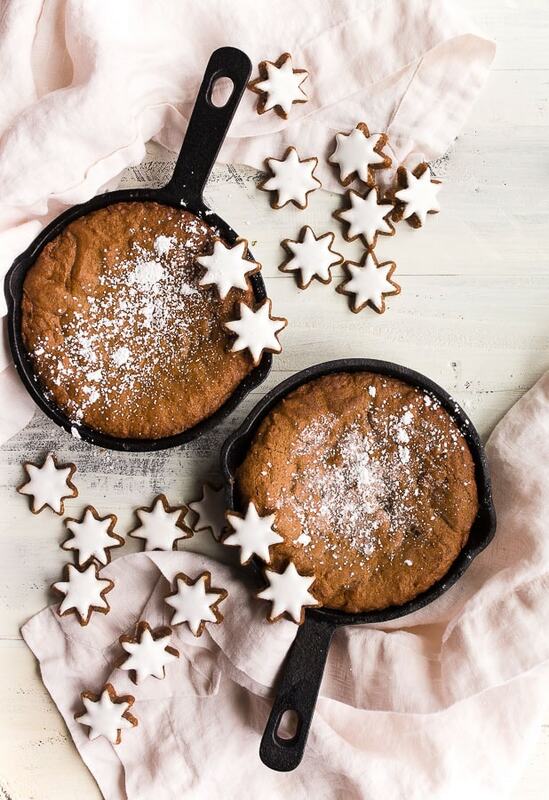 Each person gets their own personal sized gingerbread cookie in a mini cast iron skillet. 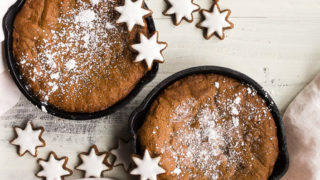 I partnered with ALDI to bring you these mini gingerbread skillet cookies for two. I have good news, my fellow small-batch bakers and cooks! ALDI is answering our prayers for cute, high-quality, affordable bakeware for two. Starting tomorrow (12/5/2018), their new line of Crofton mini cast iron cookware is available in stores! It’s all mini cast iron pieces and perfectly portioned bakeware for two! I’m overly excited, if you couldn’t tell. The line includes mini casserole dishes, mini cast iron pots, mini loaf pans, and these mini skillets (the ones here in my photos are just $5.99 each). They’re only in stores for a limited time, so please, be like me and go buy all of the mini bakeware while you can! So, naturally, the first thing I did is make a cast iron skillet cookie for two in the 6” cast iron skillets. But since I’ve shared a chocolate chip skillet cookie for two with you before (with ice cream on top, of course), I’m bringing you a gingerbread skillet cookie today. 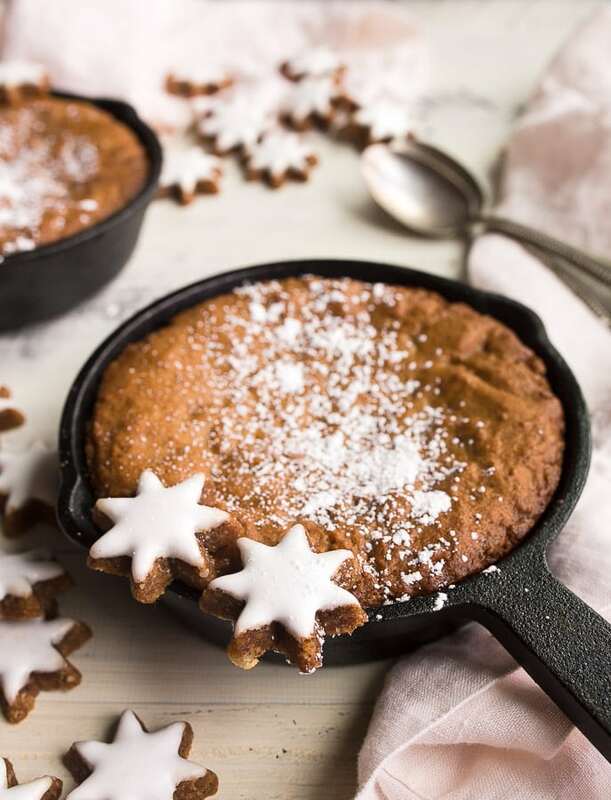 This cast iron skillet cookie is packed with orange zest, ginger, and cinnamon;, and the brown sugar and molasses keeps it super moist and gives it that characteristic ginger cookie color and flavor. The spicy cookie goes great with a tall glass of cold milk (or nut milk, whichever you drink). One of the things to remember when you’re baking with cast iron is that you need to season the pan before the first use. For these mini 6” cast iron skillets, I gave them a quick rinse in hot water, rubbed them generously with oil and then placed them upside down in a hot oven for a few hours. After the skillets cool, give them a quick wipe, and now they’re ready to use! They’re just waiting for their first skillet cookie experience. I should tell you that I repeat this process of my cast iron skillets and cookware at least once a year, or anytime it loses its shine. If I notice food is starting to stick to the surface, I know that it needs another treatment. 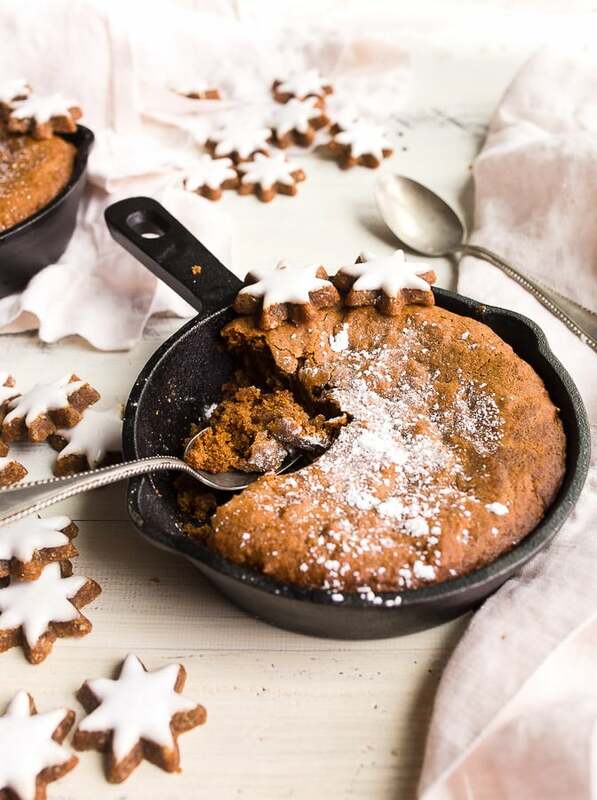 These gingerbread skillet cookies are the perfect compromise in our house, because honestly, I’m not the greatest at sharing when it comes to dessert. I hide my favorite candy deep in the pantry from my husband, so I think you would agree with me that I need my own skillet cookie. One who hides sugar from their spouse should always make personal-sized desserts, right? Another reason I love these cookies is that everyone in the house can enjoy them. My husband is mostly dairy-free, and I happily serve him these spicy little cookie skillets with a glass of cold vanilla almond milk to him. I also bake the cookies with unsweetened vanilla almond milk so that we can both enjoy them. 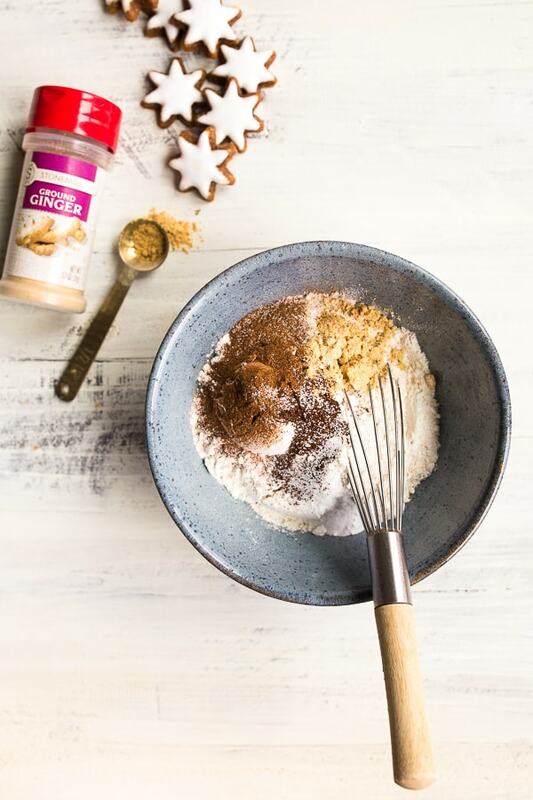 It’s so easy to make and enjoy dairy-free cookies and milk this holiday season, thanks to the vast selection at ALDI. 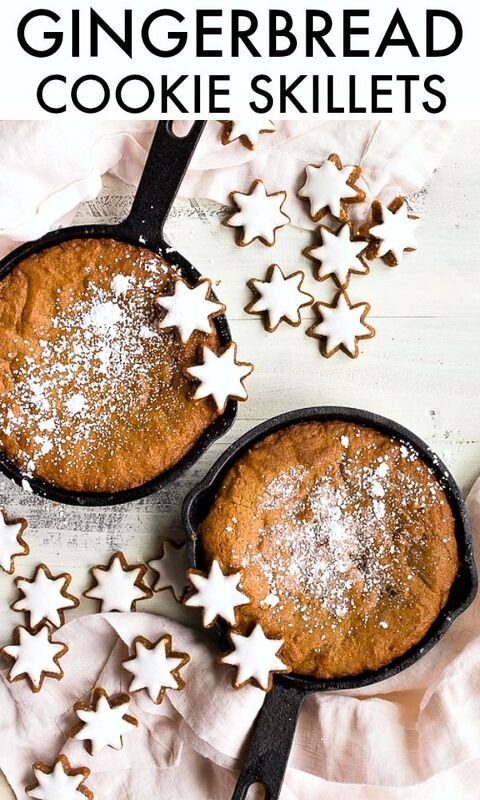 I hope these spicy little cookies in a warm skillet keep your cozy during the winter, and the powdered sugar sprinkled on top reminds you of the snow falling outside! 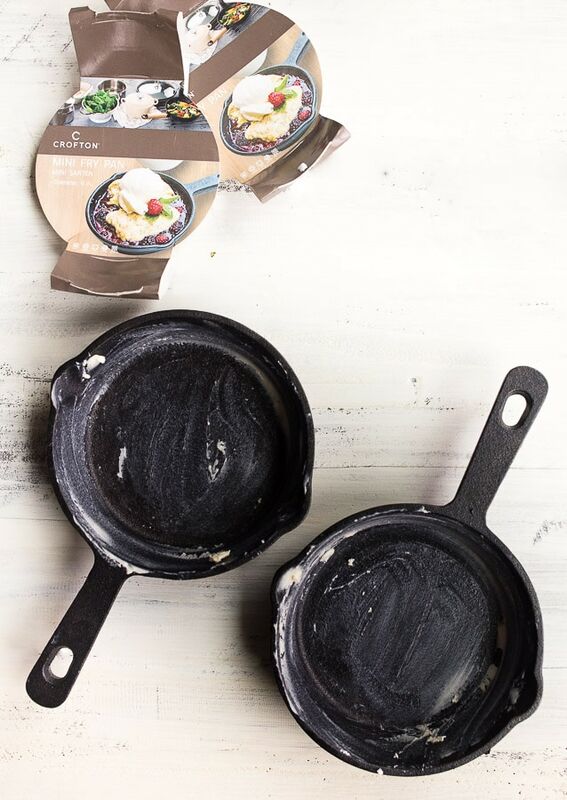 After you enjoy your cast iron skillet cookie, be sure to only wash your skillet with hot water, no soap! I sometimes sprinkle in coarse salt to help me ‘scrub’ the pan if I need to get it clean. I usually rub the skillets with butter very generously before baking a cast iron skillet cookie to prevent any sticking. Two mini skillets of gingerbread cookies! Preheat the oven to 350, and very generously butter two mini 6” cast iron skillets. Next, place the butter in a microwave-safe bowl, and microwave on HIGH for about 20-30 seconds, until melted. Once the butter is melted, stir in the sugar, brown sugar, molasses and almond milk. Stir very well for about 30 seconds to blend, and then stir in the egg white. Next, sprinkle the flour, spices, and baking soda on top. Stir the mixture until no streaks of flour remain. Divide the batter between the two skillets. Bake the gingerbread cookies in the lower part of the oven for 17-18 minutes, checking after 16 minutes. You want the batter to remain moist, and it can easily dry out in a hot skillet! The cookies will continue to cook after you pull them from the oven with the residual heat of the skillet. Let the cookies cool slightly before dusting with powdered sugar and serving. If we don’t have a 6” skillet, do you have any alternative options? Looks so good but I don’t have space for more pans! I chilled the dough and formed them like regular cookies on a sheet, and they came out great! I made 5 large cookies out of it and baked for 20 minutes. Could possibly go less but I was worried about their size, lol.